Rahul Gandhi has gone ballistic in his attack against BJP and Modi. Sounding the bugle for the 2019 “Mahabharat”, Congress president Rahul Gandhi said on Sunday, “The war would be between the Kauravas (BJP-RSS) and Pandavas (Congress)”. Rahul said while the Kauravas were hell-bent on fighting for power, the Congress, just like the Pandavas, would fight for the truth. Perhaps Rahul Gandhi is quite weak in history, like his father was. “Those who make history, don’t read history” was a famous statement of Rajiv Gandhi. Some sane people reminded him, “Those who don’t learn from history, end up repeating the same mistakes and go down as bad history.” This statement was proved prophetic as Rajiv Gandhi ended up becoming extremely bad history. In fact, he became the father of most of the problems faced by India today and Rahul Gandhi comes much lower in the list of the blunders fathered by Rajiv Gandhi. Let us take a stroll through the “history” to see if Rahul’s family indeed are the Pandavas of modern day India. We will leave the Kauravas out for the moment. Soon after the Indian independence, India began integration of the Princely states and those still controlled by the Portuguese and others. Sardar Patel handled most of the process and we know Hyderabad, Goa, Diu, Daman, Pondicherry, Mahe and other places were integrated with India seamlessly. Rahul’s great grandfather decided to handle Kashmir himself and we know how his short sighted policies converted the Paradise on earth into a perpetual thorn in the flesh for India. Can Nehru be considered a Pandava in any way? When her authority was challenged by seniors in the party, Indira Gandhi expelled all of them, usurped the legacy of Nehru and the surname of Gandhi and turned into a dictator. She shut all dissent, allowed no questions and ruled with an iron fist. She jailed all opposed to her tyranny. She pitted people against people, brought Bhindranwale to counter Akalis and dismissed all dissent with utter disregard for democratic norms. In what way can Indira be equated with Pandavas? Rajiv Gandhi allowed a free run for all his corrupt cronies. He allowed India’s greatest offender Warren Anderson to escape Scott free. He overturned the Supreme Court ruling in Shah Bano case and turned Muslim women into second class citizens in India. His pandering to the whims of the extra-constitutional All India Muslim Personal Law Board or AIMPLB has lead to extraordinary levels of fundamentalism. 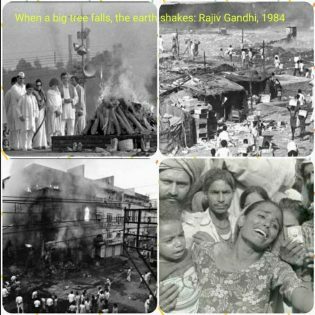 But the worst ever act of Rajiv Gandhi was opening the Pandora’s box of Ayodhya. In one single unfortunate move, he shattered whatever communal amity was there in India forever. In what way can Rajiv be considered a Pandava? Sonia Gandhi has enjoyed power without responsibility ever since she came to India as Indira Gandhi’s daughter in law. She brought down Vajpayee government in 1999 by enticing Jayalalithaa to defect. She wanted to be the PM as she claimed, “We have 272 and more are coming” after bringing down a democratically elected coalition government and forced a mid-term election on the country. When President APJ Abdul Kalam advised her to refrain from claiming the PM Chair in 2004, she unleashed her sycophants to run amok with the sacrifice story and installed a puppet PM. But the vindictive lady later ensured India’s greatest President did not get a second term. Sonia’s accent to the throne of Congress President too was a palace coup. Well, it can be called toilet coup. Her cronies locked Sitaram Kesri in the toilet of AICC headquarters to prevent him from contesting against Sonia. From there to the expulsion of Shehzad Poonawala for questioning Rahul’s unopposed accent to the throne of Congress President, the history is littered with instances of this kind of selflessness of Rahul’s family. Today, Rahul Gandhi claims his party isn’t interested in power. How hollow can a statement be ? 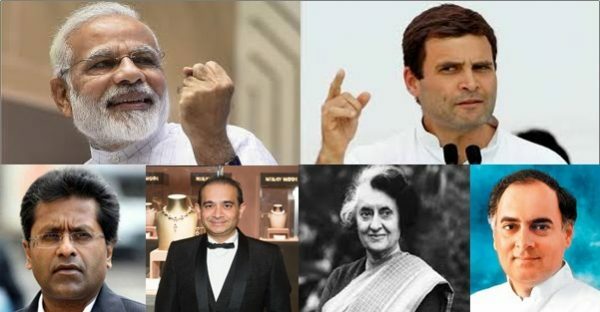 From Nehru to Indira to Rajiv to Sonia to Rahul, it was always about power, concentration of power in the “Hand” of just one family and cronies. Unadulterated greed for power has been the hallmark of his family, his party and the cronies. Does Rahul believe all the people of this country are as dumb as himself ? Rahul’s next statement was about Modi, the name. Lalit Modi has been a confirmed fugitive. But throughout his heydays, he was close to the Congress than the BJP. Be it Sharad Pawar or Rajiv Shukla or Shashi Tharoor to Rahul Gandhi himself, all of them were close to Lalit Modi. They say, a picture can speak a thousand words. 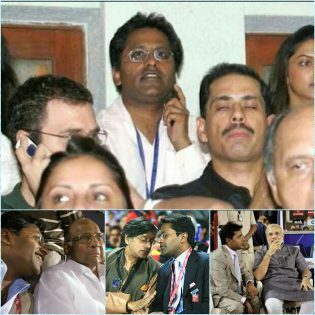 If we look at the collage, we can see how Lalit Modi shared a VIP box with Rahul and his family. Lalit Modi’s affable equation with Sharad Pawar and Shashi Tharoor too can be gauged. Then take a look at the totally oblivious way Narendra Modi shared the space with LaMo. Does this illustrate something? It is left to the interpretation of individuals. Coming to Nirav Modi, the more the Congress President talks about it, more skeletons are tumbling out of his own cupboard with Chidambaram getting irreversibly embroiled in the story. If the problem is supposed to be with the surname Modi, the surname Gandhi has proved to be more dangerous for India. Indira Gandhi institutionalised corruption and ran a dictatorial regime in India, suspending all civil liberties for close to 2 years. She destroyed judiciary and executive and created a culture of sycophantic followers. Rajiv Gandhi was the PM under whom the Bofors scam happened, which helped people like Ottavio Quattrocchi to loot India. Rajiv also divided India on communal lines. Sonia Gandhi turned terrorist Ishrat Jehan into a martyr and shed tears for the Batla House terrorists. Her puppet regime called UPA has looted the people of India like no other entity. When world was struggling against Islamic terror, Rahul Gandhi went to US and told, “Hindu Terror is a greater threat for India than Lashkar e Toiba and Hizbul Mujahideen.” His government worked with single minded devotion to prove him right. If Ajmal Kasab wasn’t caught alive, Congress would have proved 26/11 as handiwork of RSS. By the way, not so long ago, the Congress party had declared Ram as a fictional character and considered the Ramayana and Mahabharata as mere mythology. They had submitted this through an affidavit in the Supreme Court. Today, Congress President is branding Modi as Ravan which means he considers himself Ram. He also brands BJP as Kauravas and Congress as Pandavas. Since when did Congress start believing in Ram and Pandavas? Since when did Ramayana and Mahabharata become our history and ancestry? Even his great grandfather had disdain for the Hindu beliefs. How come this sudden love for “mythology”? Why this clamour for “Janeudhari” status? That brings us to the last part of “murder accused party President”. Rahul Gandhi was still in primary school when his grandmother was convicted by a court for electoral malpractice. Her election was declared null and void and she was sentenced to be jailed. That was when she subverted democracy and forced MISA. Thousands were jailed, Hundreds of people were beaten up and dozens were killed by Indira Gandhi’s oppressive rule. She was not just a Party President but a PM as well as Dictator too. When Indira Gandhi was assassinated, the Congress goons lead by Rajiv Gandhi’s henchmen slaughtered thousands of Sikhs in India. The acting PM justified the pogrom with the infamous statement, “When a big tree falls, the earth shakes.” He too was the President of Congress party and also the PM. With this gory background, the “murder accused Party President” is a very rich statement, coming from Rahul. There isn’t a dirty trick his family hasn’t deployed to win elections. There isn’t a clause in the constitution that hasn’t been abused by his family to usurp power or stay in power. There isn’t an institution his family has left untouched by the dark shadow of their greed. In a nutshell, the Gandhi surname stands for corruption, nepotism, cronyism, communalism, casteism and all that is detrimental to India. Now tell us Mr. Rahul Gandhi, which name spells danger? Modi? Or Gandhi? Dr. Govind Raj Shenoy is a Doctor, Social Media addict, Atheist Sanghi with serious Sarcasmophilia. A self-proclaimed expert in everything with very little knowledge of anything in reality!